How good is your Chinglish? If you can follow this story, I’m guessing you have lived in China hao jiu. The other day, I was buying some ershou furniture from a guy across town but I knew it was going to be a lot of mafan to get it back to my xiaoqu. All I’ve got is a little diandongche and there’s no way I can fit a guizi on it, even though I bet a lot of bendiren could do it, mei wenti. Anyway, first I tried using DiDi to book a mianbaoche, but you can only get kuaiches or chuzuches, so I had to think of something else. I don’t know any mianbaoche drivers here yet, so I thought about sending something out on WeChat to ask some of my laowai pengyou if they could recommend someone. I was at school and happened to stop by the waiban. There’s this one laoshi there who is super nenggan so I thought about asking her for help. It’s just that she’s also always hen mang so I hate to mafan her. Plus, since her English is not great and my Putonghua is only mamahuhu, we often don’t communicate well. But I decided to ask her to bangmang and I’m so glad I did. She called a guy and DUANG! Just like that, it was all anpai’d. I really couldn’t follow what she said on the phone because they were using tuhua or some kind of fangyan, which is another reason I feel like a bendan half the time when I try to talk to people here. She explained that the driver would need some kind of fapiao or fangxingtiao to show the baoan at the other guy’s xiaoqu or they wouldn’t let them out the menkou. I texted the guy right away, and thankfully, he has lived in China a long time, so he knew all about that and had it zhunbei’d. So, that night, the mianbaoche arrived right on schedule, which was amazing considering it was gaofengqi and, well, TIC, right? I had warned the baoan they were coming, so they let them park right at my danyuan which is way more fangbian than where they’d have to park otherwise. The driver had brought along another guy and they carried the guizi and other dongxi up my stairs on their backs. Wasai! These guys are so lihai! I could never do that. I considered giving them an extra tip for all the xinku, but I know it’s not the xiguan here. So, I just paid the fei and said xie xie. Then I sent a few thank you stickers to the waiban laoshi on WeChat. Chenggong le! Lol! “Mafan” is definitely a permanent addition to my English vocabulary. It’s just such a useful word. yes… i even use it with people who dont understand any chinese what causes quite some confusion xD. Sometimes when I’m Skyping someone in the U.S. I have to remind myself to NOT use some of these words. They just flow. Uh, ‘could I trouble you’ is pretty standard English too. Glad you enjoyed it, Michael. Well, at least I got the gist that you found through a colleague/acquaintance at school whom to contact for a vehicle and delivery at your apartment for the furniture you bought. Chica, no hablo Chinglish, oder meine Tochter, Ich weiss nicht was vielen Chinglish/Chinosich Wörte bedeuten, and my smartphone is going crazy trying to correct all the Español and Deutsch. Ich Liebe Dich and I miss you all! That was amazing and funny! Very well written! Had a good laugh! I think the word I feared most from the authorities was “mei ban fa”. They didn’t seem to want to “xiang ban fa” themselves, even though I was often expected to. Thanks for a great laugh! Love this! Made me laugh so hard and miss China. Zen halo le! I enjoyed reading it very much and laugh a lot, yes, it made me miss China! Good writing! Your pu tong hua is so niu! I grew up in a Mandarin speaking country – once my mom gave my husband a puppy and to spite my mom he named her Mafan! She was a rather large collie. And she was a lot of mafan! But when we took her to the vet here in the US I used to check her in as Muffin because no one really understood her name. All in all she was a sweet Mafan! So, she was a tiaopi little Mafan/Muffin? 😉 That is a great story, Julie! Thanks for sharing it. I love that you had to change her name for the U.S. vet. I got all of it except for “duang”…help me liao jie yi dian! DUANG! Now I see what it means. I was scratching my head trying to figure it out. Glad that helped! For a while, it felt like we were seeing “duang” all over the place in all kinds of ads. I wish we had another tour! What is mianbaoche (bread cart? 面包车? ), waiban, fangxingtiao, danyuan? I don’t understand these ones. Good guess, Ryan! Mianbaoche is indeed 面包车, but it refers to the ubiquitous Chinese van, supposedly because they are shaped like a loaf of bread. Quick explanations for the rest: waiban is the foreign affairs office at universities, fangxingtiao is a form showing permission to remove large items like appliances or furniture, and danyuan is the entrance (or stairwell) in apartment buildings. Thanks for reading, and good luck with your Putonghua. Even being back in the UK for over a year, the occasional zao sheng hao and zou ba slips out at work. People must think I’m a complete weirdo. Hen hao wanr de story! You xiede fantastic! 🙂 Loved and will share with my pengyou! Xie xie for sharing it with your friends! I’m glad you liked it. I wang le some words you wrote. But in general, wo juede mingbai la.. If you got the dagai de yisi, I think that’s pretty bucuo! Thanks, Michelle!I’m so glad you enjoy the blog and like the look. I set my blog up through WordPress and the theme (layout) is called Baskerville. You can have a blog through WordPress for free if you use a web address that ends in wordpress.com. If you want an address with your own domain name, you can do that through a hosting company for pay. I use DreamHost (That’s an affiliate link, so if you sign up using that link, I’ll get some yuan from them. :)) There are lots of websites and videos online to help you with setup. Best wishes on setting up your website. Let me know when you’ve got it up and running. hahaha xiao si wo le! And your Putonghua is juedui very ok la! Oh my Tian I totally ai this. Gonna whatsapp to all my pengyou in Hong Kong even though their pinyin is kinda you wenti. jin lihai. Being Chinese, I found myself enjoying reading novels that would randomly throw in these chingish words. So much fun to read. That would be fun, Stella! Any novel recommendations you’d like to pass along? I’m always up for a good read. Hi Emily! Great story, thanks! Besides being funny, it kinda gives English speakers an insight of how most conversationsin foreign languages sound nowadays : riddled with English words. Maybe the same will happen to English some day and people will really speak like this in the streets of New York ? Yes, good point! I think there is a ton of code-switching (using two or more languages in the same utterance) happening in many communities around the world, and not necessarily just mixed with English. It depends on how exposed to other languages the community is. There are still plenty of places where communication is all monolingual. We’ve been in plenty of smaller places in China that have zero English, and sometimes very little Putonghua! Thanks for your great comment, Kris! I guess you meant Gaofengqi instead of baofengqi, right? This sounds definitely an expat from Taiwan!! Whoops! Yes, I meant gaofengqi. O_O Buhaoyisi and thank you for catching that error! I’ve changed it now. I did live in Taiwan for a year, but most of my Chinese and Chinglish comes from living in Guangxi and Yunnan for the past 11 years. Thanks again, Anny! Yup. Silly typo! That is what I get for writing late at night. Are there any more stories! I xihuan! Please gaosu me! I remember when I started adding “ma” in the end of my questions in English. Friends not knowing putonghua looked when it happened. Ha ha! That is pretty funny, Jessica. Learning chinesse language bu rong yi, today xuexi tomorrow wang le..!! Lived in China for several years, moved back almost two years ago. I miss speaking like this! Reading through this (for the umpteenth time!) just makes me smile. Feels a bit like home in a way that my current home can’t. I’m glad it gave you a smile, Heather! Come hang out here anytime you are homesick for China. Interesting! But I can only guess some of the words as my Putonghau pinyin is very bad. I never lived in China. Only doing business trips few weeks at a time for 这几年了 now. While I myself is a Chinese, I never be able to talk 中文很好. Ironic, isn’t it? My ancestors came to Indonesia and settled for generations. 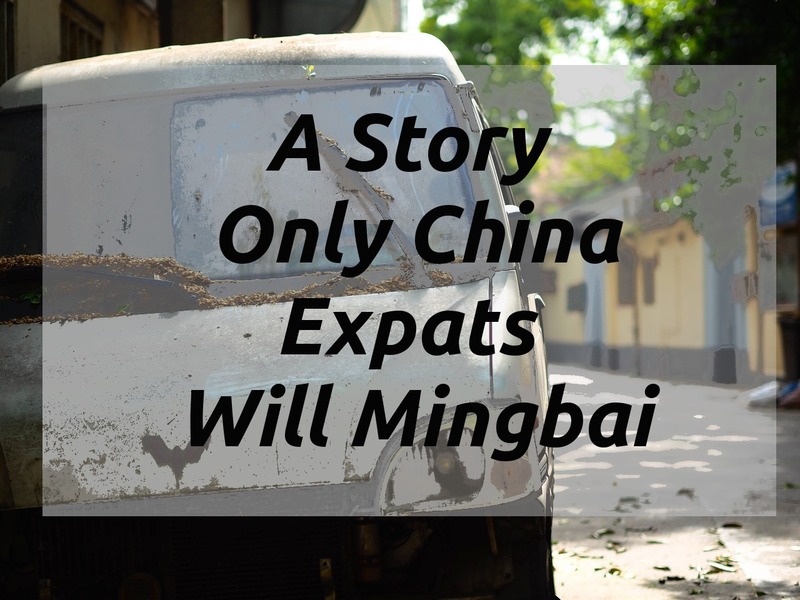 It’s quite interesting to read many of expats‘ stories about living China, how you can be confident, able to deal with locals and adapt. I don’t think I can do that. Thanks for this… I Love it! Yep.. No substitute for mafan, or suibian or lihai or Jia you…and probably more. I’m moving back to UK soon… No one is going to understand me! It’s hard to get through a conversation without one of those extremely useful words popping up, isn’t it? Best wishes on your transition back.